READY TO RUN: Assistant coach Shane Yokley is surrounded by his tailbacks during the team's annual photo day. Backs include, from left, John Smith, Hawk Love, Damon Collette and Gabe Walkup. The Lions open the season at Spring Hill Friday. 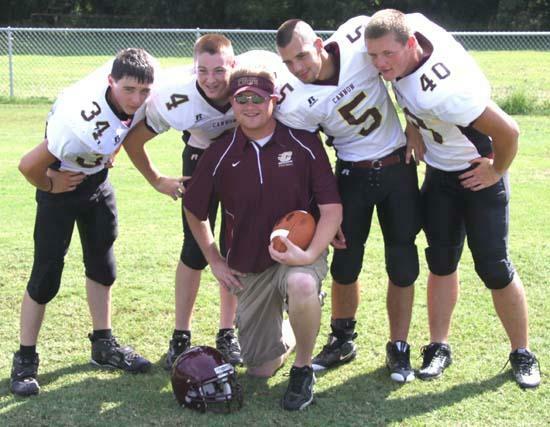 Football players at Cannon County were looking to the start of the 2010 season soon after the 2009 campaign ended in the playoffs for the first time in 14 years. Anticipation ends this week when the Lions open the 2010 season at Spring Hill Friday at 7 p.m. For those unable to make the trip to Columbia, the game can be heard locally on WBRY FM-96.7 or AM-1540 with Keith Ready providing the play-by-play. Lions Head Football Coach Joel Schrenk could have come up with an easier opener for a Cannon County team that is replacing several key players from last year's District 8-AA championship squad. Spring Hill fashioned an 8-3 record in 2009 and returns several of its top performers, including eight defensive starters and six on offense. "We are going to have to play as well as we can to have a chance to win," Schrenk said. "Spring Hill is a very good football and I don't know how things are going to turn out Friday but I do know there is no quit in our kids and they are excited for the start of the season." Already operating with a thin 42-man roster, Cannon County's depth will be tested out of the chute as the Lions have key players questionable for action due to either illness or injury against Spring Hill. "Whoever is there on Friday will play," Schrenk said. "It may not be the 22 we thought it would be but we are excited and we are ready for the season. Spring Hill was a playoff team last year and I suspect they will be a playoff team again this year. Depth will be a key because they have a lot more players than we do. I am going to play 15-to-18 guys most of the night and they are going to play 25-to-30 and that's just based on numbers. Conditioning will be a factor." Spring Hill's defense is led by ends A.J. Smithson and Dylan Murphy, along with linebacker Heath Petty, and is a unit loaded with experience. The Raiders defense will have to contend with Cannon County's spread offense, featuring several new faces in 2010. Senior Heath Simons has played receiver and quarterback in the preseason and is a do-it-all performer in the offense, while classmate Colin Jones has been stellar at all receiver positions and is the team's top break-away threat. Gabe Walkup and Damon Collette provide a strong tandem at the running back positions, and sophomore Brandon James is an all-around talent. Cannon County's defense is a strong suit. The Lions return the bulk of their experience on the defensive side, led by Walkup, Collette and Oneel in the middle. Simons heads the defensive backfield and the Lions are sound along the front. They also are in the process of building a sound program and it excites Schrenk most. "We are building a program here and that is exciting," Schrenk said. "You can see it building and what it can be down the road. I am excited about the building we are doing. I can see differences in our freshmen and sophomores and even in our parent participation. Exciting things are happening here." Take Bragg Highway to South Rutherford Blvd. Turn left onto South Church Street and then merge onto I-24 West toward Nashville. Merge onto I-840 W via Exit 74A toward Franklin. Take I-65 South via exit 31A on the left toward Huntsville. Merge onto Saturn Parkway via Exit 53 toward Columbia/Spring Hill. Merge onto US-31 S/TN-6 S toward Columbia. Travel approxmimately three miles and turn right on Raider Lane.